Phantom Cardboard: Julie Newmar, Long Overdue. I'm surprised with myself that I've just now got around to making these two cards. 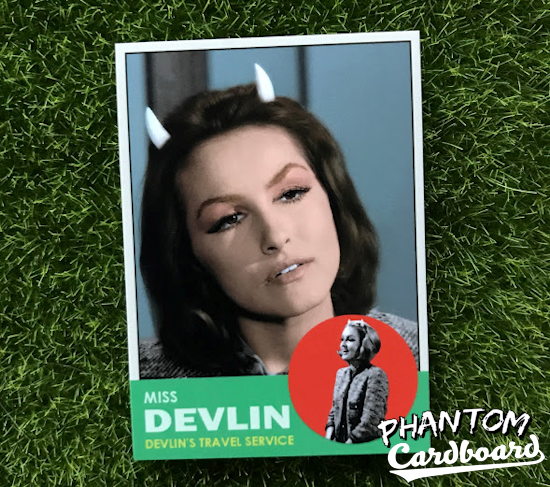 Put it this way, looking back I'm equally surprised that the origin of me making custom trading cards didn't come from me wanting to have a Miss Devlin card. To be fair, Rittenhouse Archives did make have an "Of Late I Think Of Cliffordville" subset in their 2002 Twilight Zone Series 4 card set. But, I like to think mine is a bit different melding the character into a year specific card design. For some background, Julie Newmar is my all-time #1 crush, especially as Miss Devlin. I believe I was in my early 20's when I passed by my t.v. that was -until that moment- providing background noise when I was literally stopped in my tracks. I froze and just stared. It was on a rerun of a Season 4 episode of The Twilight Zone entitled "Of Late I Think Of Cliffordville". 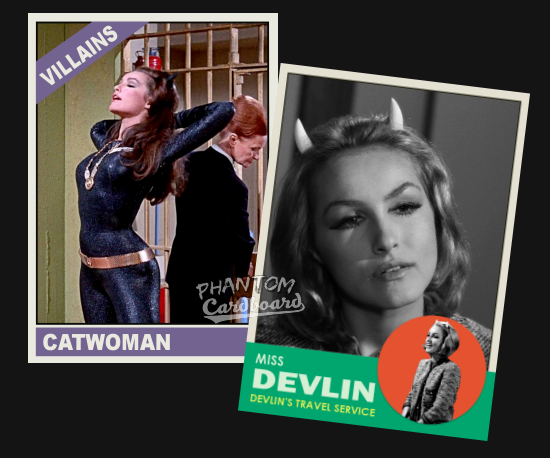 Upon researching it I found that the character Miss Devlin was played by Julie Newmar in that 1963 episode. I realized at that moment that I was born about 50 years too late. The episode itself is just okay with Julie being it's saving grace. Like I said, I'm surprised I haven't made this card until now. I've actually commissioned other Miss Devlin collectibles. Perhaps I was just wanting to make sure I could do it justice as I'd like to think that even if I wasn't the one making these cards I'd like them to be something I'd still want to own myself. I went with the 1963 Topps baseball design. Most of my stuff is confined to '80s nostalgia, so this was kind of fun to step out of the box a bit. Simple enough design, but a lot of time was spent carefully masking out the smaller image inside the orange circle. 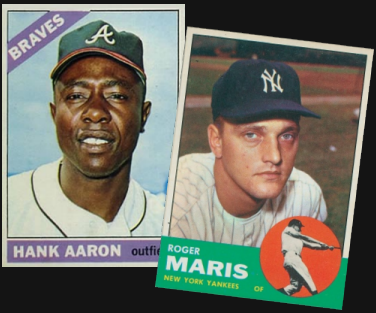 On Topps' cards the main image was a color photo was in color while the smaller one was in black-and-white. The Twilight Zone was shot in black-and-white back then, therefore the stills I have were not in color. I did actually attempt to colorize this photo. I watched and read tutorials on how to do it. At the end of the day I was just not satisfied with the end result. Maybe with some practice I could go back and retry it, but for now it'll remain colorless. I didn't realize at the time that Julie Newmar was the same person who played Catwoman in the '66 Batman television series. I mean, I knew Catwoman was a smokin' hot classic babe, I just didn't necessarily know it was Julie Newmar that made her that way. Since Julie is more recognizable as Batman's feline villainess foe I also wanted to make a Catwoman card. Since the old Adam West Batman series is synonymous with the year 1966, the Topps design from that year was really the only choice. The 1966 Topps is almost about as non-complicated as it gets. Even more so than the 1963 design used for the Miss Devlin card. So, this one really relies on the image to make it pop. I think that happened. These are two more cards I made with little hope of getting signed. Julie sells signed merchandise from here official site. I e-mailed them about the possibility of purchasing autographs on these cards, but I never got a response. Just superb. I got to meet Ms. Newmar some years ago, at an Orlando convention - a sweet lady, gracious and forthcoming to her many fans. Two beautiful designs. I think you need to work back into the 50's and 60's designs more often, as it suits you. Thank you, again! I'm still waiting for my chance to meet her, hopefully soon.